The success of the organization is in your hands. But, too often you're so busy fighting fires and scraping together reports to step back and see the big picture. That's a huge headache, and not the kind you need when your mission is at stake. It’s time to say goodbye to “that’s how we’ve always done it.” To compete for attention and dollars in a distracted, digital world, you need a modern engagement strategy that puts your supporters first. Your passion to do good is unmatch. But without the right tools, you and your staff will drown in manual processes that could easily be automated. It's time to run a smarter operation. 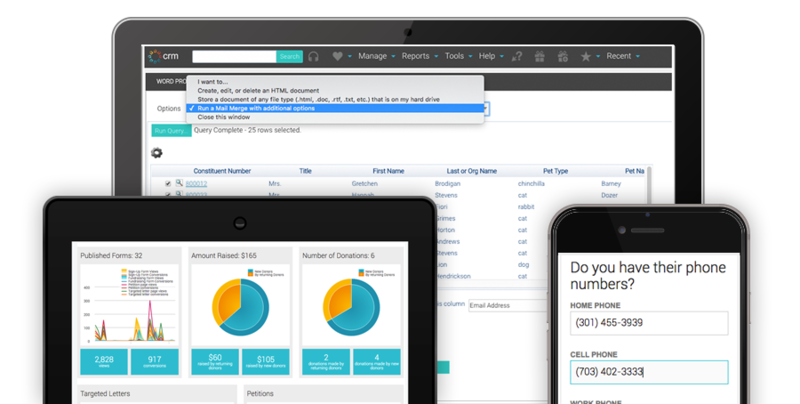 With all your data in one place, you can automate tedious processes and reassign your staff to fundraising and donor relations. Salsa has the donor reports you need for meetings and the visual dashboards you need to monitor campaign progress. Stay on top of your nonprofit on the road, at home, on vacaction and everywhere in between with Salsa's mobile responsive online interface. Sometimes, platforms can be too technical or intimidatingly detailed, but Salsa simplifies donor management, email and online fundraising. They have put together the ingredients that I need as a mid-sized nonprofit. Navigating board meetings or prospect meetings are stressful enough, why not trust Salsa to deliver the accurate reports you need, at the click of a button? 10 Pre-built reports including donor detail, LYBUNT, SYBUNT, major gift cultivation, and more. Visual dashboard analytics to track event sign ups, online giving, and engagement metrics. Easy export and import into Quickbooks Online. By understanding what’s important to your supporters, Salsa empowers you to engage supporters about what’s most relevant to them. Whether it’s pet adoptions to animal lovers, nutrition information to the health conscious, or environmental tips to conservationists, relevant content is the key to improved engagement. The more you know your supporters, the more personalized your interactions will be. Track every historical interaction such as donations, events attended, and volunteering events. Store meeting notes and set up workflows that remind you when to reconnect with prospects and donors. Create and track unlimited custom fields to build the deepest profile on each constituent. Never again miss an opportunity to thank a donor, volunteer, or advocate for supporting your mission! Drive up donor retention by delivering that follow up thank you which carries forward your campaign or organizational branding and reinforces the impact of the gift. Automated gift acknowlegment or event registration confirmation emails trigger based on supporter actions. When new gifts come in, create direct mail acknowledgment letters and complete your mail merge in minutes. Seamless kickoff, onboarding, and implementation so that your new database is optimized for supporter engagement. 60-day Smart Start Fundraising course to build your first giving form, email, welcome series, and e-newsletter in Salsa Engage. Rich knowledge center with answers to common questions and guides for navigating Salsa CRM and Salsa Engage. eLearning platform with ongoing training courses, Salsa certifications, and additional classes will help you grow professionally.